Whether you cloth diaper or diaper like normal folk, you've probably Googled different diaper pails to find the best one in form and function. Well this pretty little diaper pail is both! 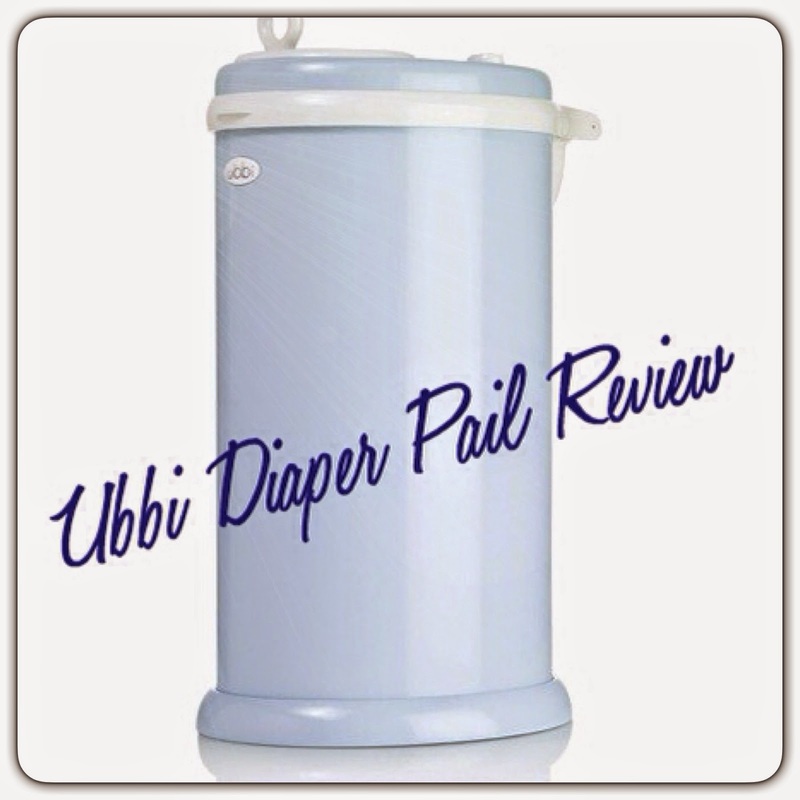 Keep on reading for an overview and my review of my Ubbi pail. Alright, let's get all the technical stuff out of the way first! Made of powder-coated steel. Not only does this make the Ubbi lightweight and easy to move, it doesn't absorb odor like regular plastic pails. Two rubber gasket seals (one on the bottom of the lid, and one surrounding the pail opening) to help "keep in the stink". Profile of the Ubbi is slim and ovular. Ubbi designed this shape so it's much easier to fit into smaller nursery space. Comes in 10 gorgeous colors! The one I have pictured is light blue but with the colors that Ubbi has to offer, I'm sure you'll find one to fit your nursery colors :) They also have stick-on decals you can purchase separately to jazz up your already beautiful Ubbi pail. No need to buy "special" bags. The #1 great thing about the Ubbi is that you don't have to buy special bags from Ubbi in order to use this pail. They do of course sell their own biodegradable bags and a cloth diaper pail liner, but any old garbage bag, grocery bag, or cloth diaper pail liner from another brand works just fine! Ease of use when changing out bags. It's a simple system in which you drop in the bag, drop down the rim, pull the bag back up through the rim, wrap and close the lid! Easy to clean. Because of the powder-coated steel, cleaning the pail is easy. Every time I do diaper laundry, I take a Clorox wipe and wipe down the lid and all the parts where the poo or pee may have come into contact with the pail. So we cloth diaper in our house and we use Blueberry diaper pail liners (because they come in super cute prints! ), changing out the liners is easy and I really don't have any big 'complaints' with our Ubbi. I'm not sure if it's different when using disposable diapers, but I do notice that when I go to take out the pail liner, there is condensation on the inside of the pail, I'm assuming this is because the poo/pee from the diapers is warm (obviously) and so condensation builds up since the entire unit is enclosed. No biggie! I leave the lid open for the Ubbi to air out until the next diaper change. Oh yes, keep in mind that right now we exclusively breastfeed, so we don't have any gross solid poops just yet! Speaking of smells...the double rubber gaskets do a great job of containing the stink, when the lid is closed you can't smell anything, and right now even when we leave it open we don't smell anything (assuming this is because oxygen gets to circulate in the pail to help air it out???). The Ubbi holds approximately 12-15 cloth diapers (my son is almost 5 months old, I change his diaper roughly every 2 hours, and I do diaper laundry every 2-3 days) and I think something like 20-40 sposies. The Ubbi retails for approximately $80 in stores. This is definitely on the pricey side for a pail that is designed to hold your child's poopy diapers...but if you've got money to shell out on a nice decorative and useful piece of decor for your nursery...I'd totally recommend it. Plus, once your little one is potty trained and you no longer need the Ubbi to hold diapers, you can easily transition the pail into a designer garbage bin in another area in your house! A wider or bigger opening to make this pail cloth diaper friendly. A step-to-open feature to make diaper changes easier, hands-free, more mess-free and quick. Want to see my overview/review on this even though you've just read it??? Click below!